It’s not easy being a cigarette company in India — brands can’t advertise on TV or print, cigarette packs are mandated to carry large warning labels, and people are gradually smoking fewer and fewer cigarettes. But cigarette companies aren’t giving up — they’re coming up with creative ways to get more consumers hooked on their products. 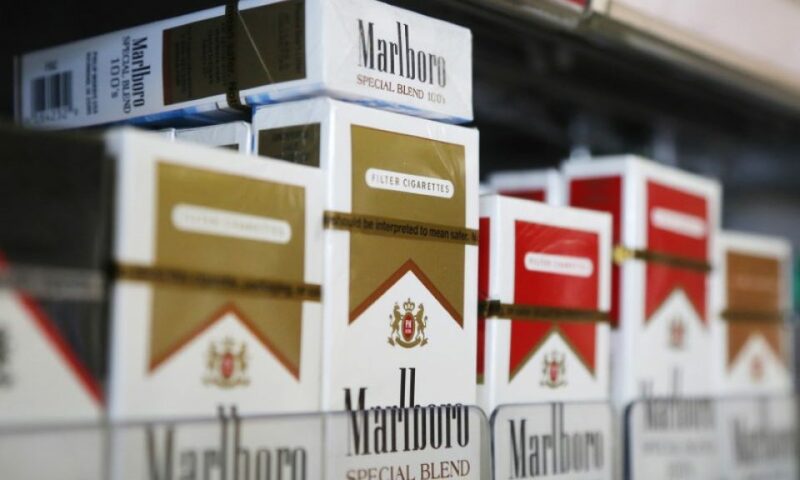 Leaked documents from Philip Morris, the biggest cigarette manufacturer in the world which produces the brand Marlboro, have revealed how the company might have circumvented existing laws to drive brand awareness for its products. 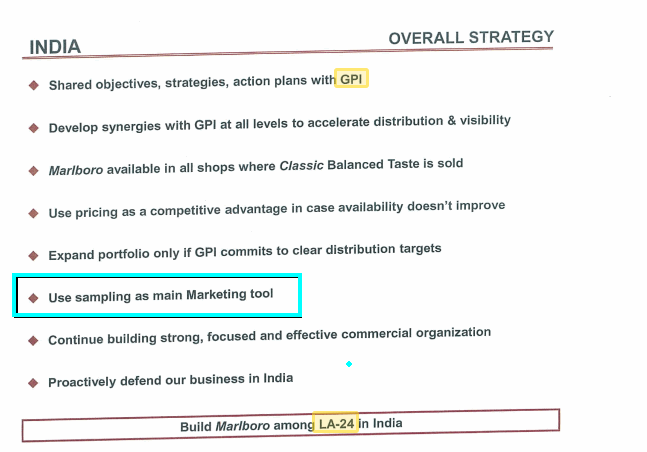 Documents from 2013 show how Marlboro conducted extensive “Market Insight” activities across Delhi, Mumbai and Pune, through which it sent representatives to small cigarette shops. These representatives were young and well dressed, and engaged customers in conversation. During the course of these interactions, these representatives would ask customers questions and fill up a form, and also provide free Marlboro samples for their consumption. It is, of course, illegal to hand out free cigarettes in India. 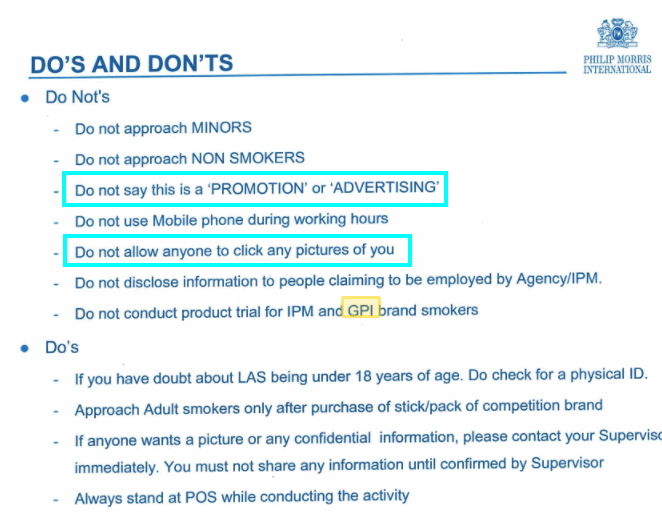 Marlboro contends that these were mere “sampling activities” used to collect data, and are hence allowed, but its own marketing decks say otherwise. 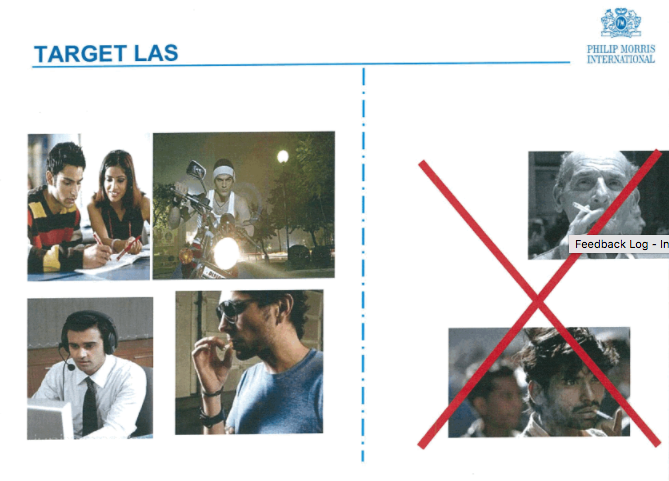 “Use sampling as main marketing tool,” says its leaked India Strategy deck for 2012. And the meticulousness with which these sampling activities were carried out shows how serious the company was about its promotions. 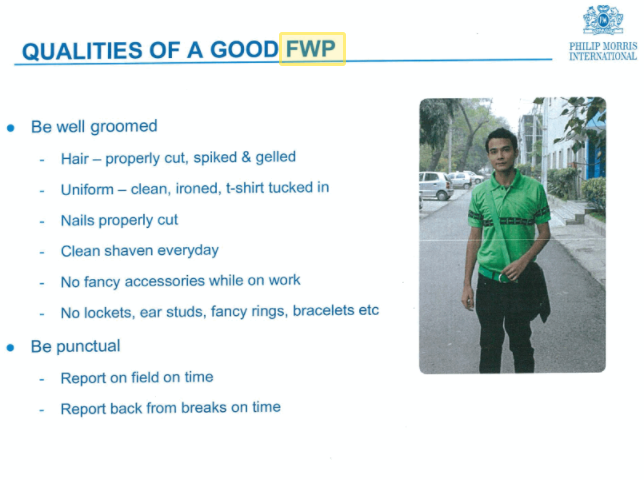 A training deck for representatives detailed how exactly they should dress and approach customers. Marlboro representatives were required to be well groomed, with their hair properly cut, spiked and gelled. They were to wear a clean Marlboro uniform with a tucked in shirt, and fancy accessories were frowned upon. These representatives were also given detailed instructions on whom to target. According to its deck, Marlboro was looking to build its presence in the 18-24 segment of the population that was relatively affluent, and these representatives were told as much. Young, upwardly mobile people were their “Target LAS (Legal Age Smoker)”. Old or poor people were a strict no-no, and were crossed out in bright red. The representatives were given a sample of Marlboros to smoke, and then asked to fill out a form. The form asked them to rate Marlboro on a scale of 1-5, and asked respondents if they were likely to switch over to the brand. But while it might seem like a traditional market research activity, representatives were asked to talk about the “Key Message” — how Marlboro’s cigarettes had a unique “SmoothFlo filter technology”, how they came from the finest blend of Virginia tobaccos, and provided a balanced taste. While Marlboro might maintain it was merely collecting data, this was clearly a marketing activity, and even the company seems to have realized as much. Representatives were expressly told to not call what they were doing “Promotion” or “Advertising”, and more damningly, told to not let anyone click pictures of them. And this operation was widespread. Company documents show that as many as 8,30,000 such “contacts” were made in 2013, costing the company $1.8 million (Rs. 10 crore as per 2013 exchange rates). At $2-3 per contact, these were cost effective — with traditional TV and print ads disallowed, this technique helped Marlboro reach out to thousands of prospective customers. Delhi health officials say what the company has done is illegal, citing Section 5 of the country’s tobacco control act. “No person, shall, under a contract or otherwise promote or agree to promote the use or consumption of” cigarettes or any other tobacco product. The law carries a fine of up to 1,000 rupees (about $15) and a sentence of up to two years in prison for a first conviction,” says the act. Smoking already kills over a million people in India every year, and large tobacco companies flouting regulations to reach smokers aren’t helping.